Growing Silverbeet has been one of the most successful vegetables we have grown. They’re so full of benefits and so good for you. There’s so many delicious dishes you can make using Silverbeet, i will share my yummy Silverbeet pastries here on the blog… Super easy to make and so delicious. I use a mix of premium potting mix and organic compost. I also mix through a handful of blood and bone fertiliser. Silverbeet loves rich soil and following these steps has given us so much success. Silverbeet grows pretty quickly, i like to call it the ‘Star’ of the garden since he likes to show off his impressive growth. Silverbeet loves a part shaded area. The heat tends to cause the Siverbeet to wilt dramatically. so ensuring you plant the silverbeet in a part shade location will result in the best results. 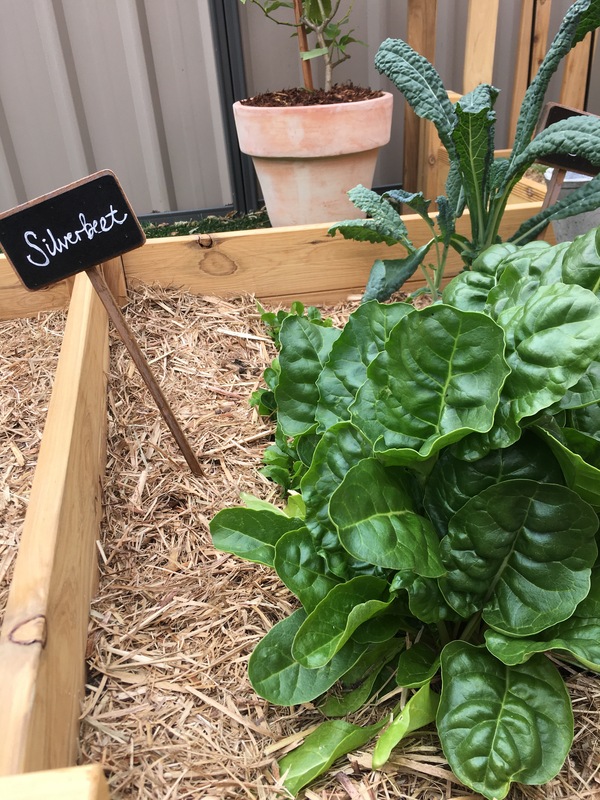 Silverbeet loves mulch, this will help it to retain its moisture. we used organic sugar cane mulch. Ensure not to mulch too close to the plant as this may damage it. Generally, you can harvest Silverbeet at any stage. While leaves are still young and baby like they go well with salads. Once the leaves become alot bigger theres so much you can do with it including my easy ‘Fetayer’ pastries so delicous and super easy to make. I will upload the recipe real soon. When Harvesting silverbeet be sure to use CLEAN shears, or a sharp knife and simply cut at the bottom of the stem. Harvesting will encourage new growth. We have been lucky enough to have harvested 4 big batches of Silverbeet from the one plant. So planting just one plant will go a long way. How to use your Harvest? saute with onion, garlic and mushrooms top on toast with eggs. Silverbeet & Mushroom potato bake. Theres so many ideas just get a little creative in the kitchen, the results are so well worth the effort.